Available from Saturday 1st September to Saturday 8th September 2018. A superb holiday opportunity. Price for one week, just £500. NOW BOOKED. WE WILL LIST THE AVAILABLE WEEK FOR 2019 VERY SOON. A two-bedroom (sleeps 6) penthouse apartment at Barnsdale Country Club & Spa, which is situated close to the Walled Garden Holiday Cottage and just 400 yards from the banks of Rutland Water. The apartment comprises one double bedroom with en suite, one twin bedroom, one bathroom & WC. There is an open plan lounge/diner/kitchen and sofa bed in the lounge. The walled balcony with table and chairs has beautiful views over the formal gardens and Rutland Water. The price for a 7 night stay is £500 (£749.98 if booked elsewhere). You may check in after 4.00pm on the arrival day and you must vacate before 10.00am on the day of your departure. Rental of the apartment gives you full use of the resort’s facilities throughout your stay. These include a pool with jacuzzi, steam room, sauna and newly refurbished changing rooms, 9-hole golf course, crazy golf, tennis and squash courts. There’s also a beauty salon plus a bar and restaurants. The apartment has a fully fitted kitchen including fridge/freezer, dishwasher, microwave, oven and washing machine. The club itself is set in 70 acres of beautiful well-maintained grounds with fabulous views of Rutland Water. All linen & towels are provided. This includes towels for the swimming pool. There is a small charge for electricity during your stay in an apartment at Barnsdale. This is payable at Reception at the end of your stay. Pets are not permitted anywhere on the resort. If you are interested in taking up this opportunity or wish to discuss any details, please call Charlotte on 01572 720388 or click here to enquire by email. Please note that this apartment is not part of The Walled Garden Holiday Cottage itself, but the week offered is a timeshare week that belongs to the owners of The Walled Garden. It is only available for the dates listed above. 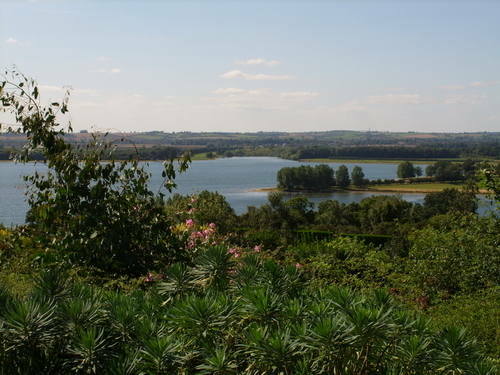 Enjoy stunning views of Rutland Water from the grounds of Barnsdale Country Club.